“Mommy go to work” | .durban.single.parent.male. An older picture, at Sophie's 1st birthday party. 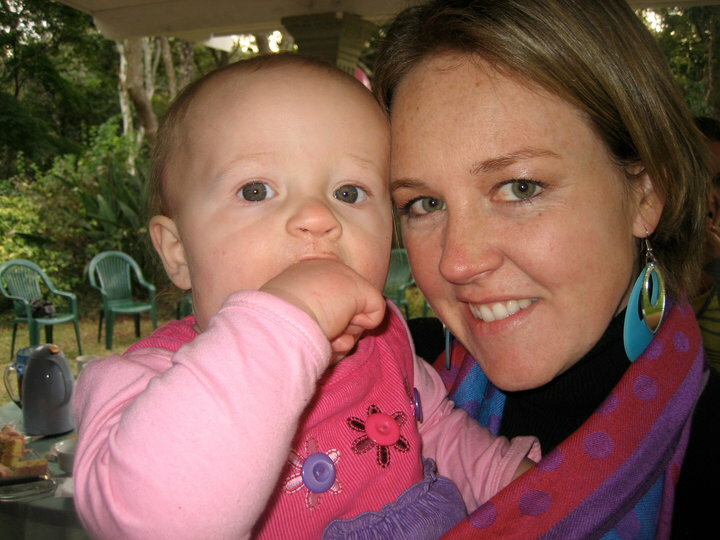 Sophie turned two on 15 June, while Janie was in hospital. It was a Wednesday. I remember sitting with Janie in the ward as she sobbed about missing her precious little girl’s birthday. We had plans to hold a big birthday party that weekend. Plans that were scrapped. Plans that were never fulfilled. In the three or so months of Janie’s employment at Gorilla Creative Media, I had taken over the role of the house mom. I’d fetch the kids from playschool every day, put them down for naps, make dinner, wake them up and get them ready for bathtime and supper. Janie would normally return from work around 5 or 5:30 pm, either during bathtime or just afterwards. We’d always have supper together, and we’d alternate between who would read stories. Truth be told, Janie normally did the story telling, as by the time she’d arrive home I was so over being a mom that she’d jump in and ride the roller coaster until the kids went to bed. It was a good rhythm, one I miss. Not that she doesn’t feel things. Whenever a child is hurt at her playschool, Sophie is the first one on the scene with hugs and kisses. The FIRST one. Whenever she hits me in any way and I say “ouch,” she always says “sorry, daddy,” and strokes my head, gives me a hug and a kiss. She cares for other people very, very much. It’s just her own personal safety that she disdains. How does little Sophie express her sadness at not having her mommy around any more? This was said over and over again for the first few weeks after Janie went to hospital and subsequently died. At times I would have her on my lap, cuddling, and she would say it again and again as if it were a magical mantra. What words does a two year have in her vocabulary to express her longing for her mother? Unlike Seanie, I have not told Sophie that mommy died. I have instead said that mommy went to Jesus, and she would repeat what I said. Every night at bedtime, I pray with the kids. I speak to Jesus with the kids there. I have no clue whether she makes the connection between the being I speak to in prayer and mommy and where she might be. There is a pretty big difference between a two and a three year old. So we have not crossed that bridge. In fact, we have not taken the exit leading to the bridge. Sophie has gradually stopped saying “mommy go to work.” However, since Seanie has begun to open about his mother, I have begun to bring out pictures of Janie. There is one I keep by my bedside. Sophie loves that one, it was taken before Janie and I were married. She looks positively modelish and beautiful in it, and Sophie just grins from ear to ear and says “mommy!” to it, often hugging it. She expresses her love for the mother she will never see again in person in this life. To her, mommy will return someday, so she express longing, not grief. There is no before and after for Sophie, there is simply rhythm. Rhythm and repetition. Now she is becoming accustomed to a new rhythm, one lacking a major component. She still recognizes mommy from photos and the like. How long will that last? I am convinced that I will be the one to provide her what memories she has of her mother. Seanie may have his own concrete memories, and one day he will be able to share them with me. But what about Sophie? Will there be anything solid that she will be able to call upon sometime in the future? Personally, I doubt it. She had only just turned two when Janie passed away. She will always know that that’s mommy in the picture there, but only because I keep the pictures out and she can sustain that tie to the image. If I were to take all of the pictures off the wall, if I were to hide away the one on my bedside, would she forget what her mother looks like altogether? Probably. So that is assignment number one for me, as far as Sophie is concerned: sustain what memory exists. You had a mother, Sophie. A wonderful, beautiful mother who loved you with every fiber of her being. I often shudder at the thought of raising a little girl. Boys I get: I was one of three. Seanie is familiar territory to me, even if he is such a sensitive little chap. He’s still a boy: he wants to kick the ball, he wants to play with his trucks, he wants to wrestle. Sophie, for all her braggadocio and sometimes boyish tendencies, still loves dolls. She talks to them, brushes their hair, carries them around until she hilariously hurls the doll across the room and laughs. Hey, she doesn’t have to be a mom today. But I see that she is rather different from Sean in some pretty fundamental ways. Sophie is also a social butterfly, whereas her brother is more introverted and thoughtful. Sean is feeling this loss on a very profound level, even if he is not able to express it very well. Sophie, I imagine, feels the loss too, but she just charges headlong into life with the same gusto as ever, shooting first and asking questions later. This is our Sophie loaf, always one to live in the moment, much like her old man. I have no idea how I will approach the subject of her mother’s death when the time comes. Of course I am jumping way ahead. But as any father of daughters will tell you, these are the things that play on our minds. Now I’ll be doing this without Janie’s sage hand, without her deft touch. Certainly she invested so much into me, but we had never arrived anywhere near questions such as those. To put it mildly, that stuff scares the crap out of me. But that’s not today’s worry. I really do know that. My concerns for now are potty training her. Boys and periods are still quite a long ways off, thankfully. For now I have this rambunctious little pickle that just loves her daddy to death, and for all her temper tantrums and attitude, she is still just one of the most caring and sweet children I’ve ever met. She gets that from her mom, who was all that and more. I’m excited to see the kind of young woman Sophie grows into. The question of her grief does not weigh on my mind as heavily as Sean’s, but that has as much to do with her stage of development as anything. There will come a time when that becomes more prevalent, and you’ll all hear about it then. For now, she sleeps well, she eats well, and my, she fills her nappy exceptionally well. These are the day to day concerns of any parent: is my child healthy? Yes. Is my child happy? Yes. Is my child thriving? Ja, my angel, but daddy’s at home for you. Oh how I am remembering those early days of my own grief as I read this. Keep writing…it will do you wonders. I lost my husband three years ago when our three children were ages 4, 20 months, and 5 months old. Every night my almost two year old would ask for Daddy to rub her back. Every night I had to tell her again that he wasn’t coming home. It was like tiny needles all over my skin. All the time. Time doesn’t heal anything at all…but healing takes time. Hope that makes sense. I found out about you from my friend Heather Salfrank Joseph. We were in college together. I’ve prayed for you and your little ones and don’t even know you. I remarried a year ago. My children won’t have many memories of their biological father and I always feel that weight…to help them remember, to help them know a little of him, and to watch them, always watch them, as they grieve in stages. This will be our life. Thinking of you, as one who hasn’t been where you are, but has been slightly near there. you have a real talent, phil. words flow so easily! thank you for sharing your life with us. Phil, your father heart is every bit as beautiful and tender as I imagined it would be and more. I have a knot in my throat that is not going away as I think of you and your moments with your precious babies. They are so blessed to have you there for them. Thank you for writing this inspiring expression of love. Take good care today. Thinking of and praying for you. P.S. Your pictures are lovely. The pictures of Jane holding her babies will be very special to your kids, they will be able to see her mothers love for them. It will be so important to them to see that she caringly and lovingly held them. They will know they were loved by her. love to you. Thanks for putting it down, Phil – so well! – for all of us. It helps you in your grief…it helps me in mine to read your heart. It would be easier to read if I weren’t crying so much! At 3 years, Daddy, I love you.” At 10 years, ”Dad, whatever.”​ At 16 years, “My dad is so annoying.”​ At 18, “I’m leaving this house.” At 25, ”Dad, you were right”. At 30 years, ”I want to go to Dad’s house.” At 50, ”I don’t want to lose my dad.” At 70, “I would give up everything​ to have my dad here… with me.” You only have one dad. -And Sophie is SO very lucky you are hers!